According to Wikipedia, a New Year's Resolution is a commitment that an individual makes to a project or the reforming of a habit, often a lifestyle change that is generally interpreted as advantageous. The name comes from the fact that these commitments normally go into effect on New Year's Day and remain until fulfilled or abandoned. Remain until fulfilled or abandoned? Abandoned? Okay... So some resolutions are meant to be abandoned, right? I tried not to think about resolutions for 2009 since I was thinking time would come that they're no longer followed. Not until I found the definition above. So here is a list of my resolutions for the new year. Go to mass every Sunday at the Xavier University Chapel. Start thinking positive all the time. Don't worry too much. Don't be insecure. I'll try. Avoid cramming. Be a responsible student! Avoid backbiting. Stop being mean! Those are my ten new year's resolutions. I really hope I can commit to each one of them. So help me, God. How about you, what are your new year's resolutions? Today is the second to the last day of year 2008. Before I welcome year 2009, allow me to share to you the highlights of my year 2008. STUDIES. I really had a hard time dealing with my studies this year. Although I made it to the Dean's List last March, I still think I'm not doing good at all. Last semester, I got very low grades which is why I wasn't able to make it to the Dean's List anymore. I was even scared I wouldn't be able to maintain my scholarship but fortunately I still have it! Thank God! Well currently I have so many requirements to accomplish: projects, assignments. God, help me! By the way, I'm taking up BS Computer Science at Xavier University and I'll be graduating this March, hopefully. So just imagine how busy I am. SOCIAL LIFE. Well I've had so much fun this year even though I'm not in good terms with someone right now and even though I had a very self-degrading experience early this semester. I have attended several gatherings and shared more bonding moments with my friends especially my blockmates. I also had great fun and adventure in different places. Last summer, I was in Manila for my OJT and the IT department of the company I was working for, had an outing at Zambales. We visited two nice islands there! I also went to Enchanted Kingdom with some of my high school classmates. During the semestral break, I explored Camiguin Island with four of my blockmates. I really had a blast! FAMILY LIFE. I think my family is doing good. I mean, problems never stop coming right but then I'm glad we're still hanging on. But this year, I really had my full attention given to my sister who's going through a lot lately. I really can't forget what happened last summer when we were still in Manila. It wasn't easy. It was too hard to take. I guess it was the worst thing I ever encountered in my life. But what I like about that experience is that it brought me and my sister to a deeper relationship. We remained strong by always being there for each other. I hope God will grant her the end of her sufferings. Who among you are Heroes and Gossip Girl fanatics just like me? Did you know that Kristen Bell who played the late Elle of HEROES is the same person who plays as the Upper East Side blogger with all the hot gossip as the narrator on GOSSIP GIRL? Yeah. I was as surprised as you are. Or... Am I too late to know about this? It's quite funny 'coz I have been watching HEROES (whose volume three just ended) and GOSSIP GIRL (whose latest episode, the 13th of season 2, is my favorite) and I just found out about this yesterday. *laughs* It was unbelievable at first so I tried to compare Elle's voice and Gossip Girl's and see if they are the same. Watch and listen. Uhmmm.. yeah. So true! Only that Kristen's voice in Gossip Girl is gossipy, of course. I like Kristen Bell. It's just so sad that we won't be seeing her anymore since her character was killed by Sylar (played by Zachary Quinto, a very close friend of Kristen Bell and rumored to be his boyfriend). Oh well... I guess Kristen Bell's career is at its peak right now. I mean... being part of the famous Gossip Girl? It must be something she should be proud of. She knows we love her. To BEVS: Thank you so much for being my dearest and closest friend all these college years. It has been fun being your partner in almost all things. You have been my neutralizer. Haha! You have no idea how grateful I am to have you. Let's keep this friendship forever, okay? To ARRIANE: It has been fun and great having you around. You have always been there to make me strong and realize some philosophical things. Haha! :p It's always an advantage to have a more mature and more experienced friend like you. Experienced? Aw! Wahehe! Thanks for being my wisdom! Char! To SHANG: You remind me how useful I am by always making me feel like you need me despite the many friends you have. We may not always hang out together but we're always there whenever we need each other the most. Thanks for being true to me, Shang. And please, I may not be strong enough for you, but please please be strong, okay? Never give up! And as always, I'm here for you. To BLONDZ: Honestly, you have been so distant these past few years. You are so pre-occupied with a lot of things. And hell yeah, we've been through A LOT. But still, I thank you for the times you shared with me just to cope up with the times we've lost. Thanks for keeping what we have alive. May you be happy wherever and with whomever you are. 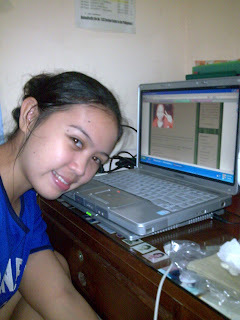 To THESA: I know a lot has been bothering you and at times I can feel that you don't know how to handle or express them. But with me, you don't have to worry. I may not totally understand you but one thing's for sure, I'm here to listen to you and just let you blab things out. It's one way to release stress right? And Thes, hang out with us sometimes okay? To KEN: I know you have a delicate heart inside you and thanks for letting us in. It has always been my pleasure to be told about your aches and happiness. Just keep on loving and having fun, okay? And yeah, I'm always here to understand. To CAYE: We may not be that close to share secrets or problems but it always felt nice whenever we have time to talk about anything despite your busy schedule. I like the way you're living your life, Caye. Full of happiness, full of love, without insecurities. Perfect! To GLAIZEE: I know I have already told you how I appreciate you so much. I'm just so thankful that a person like you still exists. You're one of a kind! And it feels good to hang out with you, very happy-go-lucky. And also, we're both crybabies! Haha! It's nice to have a friend who is as sensitive as I am, or more. Stay the same, Glaiz! To OZZIE: Of all the guys in our block, I am most comfortable around you. I just don't have any problem with you, Oz. It's like I have nothing to worry when you're there. Char! But yeah, seriously, you're such a nice friend. And the thing I like about you is that you have always been an optimist. Nice attitude! And by the way, thanks for being in our team. To DOM: Truth or dare? Haha :p It was fun having that conversation with you. Thank you so much for you know, for being nice and all. And I'm so sorry for making you feel something which isn't true at all. I didn't mean to. Thanks for the times :) .. for treating me the way a lady should be treated. To JEP: I know that it's him that you love. Bwahahaha! Joke! :p Seriously though, thanks for being my academics consultant (what? haha), and for the company especially those times you had no choice but to wait 'til I get my ride first. Haha! I'm sorry. But yeah, thanks! To DAN: Remember that time we rushed to the hospital? We were on our way towards becoming the next heroes! LOL. Well, that was a moment for both of us. Char! It was an unforgettable experience and I'm glad I shared it with you. Another char! Hehe.. Well, thank you so much for the rare times. To EDWARD: Have you read my card, already? Hehe. Uhmm.. Dward, I'm sorry but it feels good whenever I annoy you. Haha! Evil me. It's coz I know you'll never get angry with me. Haha! Right? Awww.. Sweet :) Thanks for being like that.. and thanks for those two big hugs u gave me during the party. Haha! It proved you're not angry with me. Thanks! Okay. I thought my Christmas is gonna be fun or merry. I miss everyone. I only have my parents to celebrate with. My sister and two brothers won't be home for Christmas. Sad, right? But I think my situation is better. At least I have my parents. I just can't imagine being in the shoes of my siblings. They're out there, celebrating with their friends. But still, that kinda feels lonely right? Oh my. I can't imagine celebrating Christmas without my family. Soon, I'll be working. I might be all by myself next Christmas. Ugh. But I wanna see to it that I'll be home every Christmas. I'll do what it takes. Wait, have you noticed the shift? From family to lovelife. Crap! I'm sorry. I got out of track. Well either way, the truth remains: my Christmas is lonely. But I'm not really sad. It's normal! Good thing I have other things to do online: blog, play games, check emails, chat at YM, watch movies, make projects and assignments (I hate my teachers for these! ), etcetera etcetera... Merry Christmas to me!!! Anyway, some of us stayed somewhere over night. It was fun though. Spending time with a new crowd just drinking, talking, laughing, playing dart, billiards, spin-the-bottle game, etc. And yeah, I've discovered a lot from talking with different people. And they made me feel good. Talk about compliments. Gawd, I never heard such things in a long time. Maybe it's the greatest gift I have received. You know, being appreciated for what you have and what you are, realizing your worth. Such a nice feeling! Flattering... except for some things that got in the way like your friends having to deal with some issues you are actually involved in. Although I preferred them to just let us be, I still love them for trying. I appreciate the effort. Some things are just meant to end. What's lost it lost. And by the way, it's Christmas! Be happy! And I am happy! I also finally got the chance to spend time with my bestfriend who I miss so much. Gawd, last night was really memorable. I guess I'll be having a merry Christmas. Thank you, Lord! It was a good start. I hope it goes on and on. I'm not sure if that's what they call it. I just found out about this cool invention based in UK, a giant beach ball that can contain a human being who then tries to walk on the water. I've seen the video and found it funny. *laughs* But I'm kinda curious how's it gonna be when you are inside a ball then you try to walk on the water. Gosh! Wouldn't that be fun? But I think it's hard because it's not easy to balance yourself considering the buoyancy of the water. You'll just end up stumbling or rolling inside. Pathetic! *laughs* Oh well, it would give you an idea how it is to be a hamster. *winks* But I think this is a great workout too! It's a great challenge. Awwww.. I so wanna try it. I'm sure you'd feel the way I do after while watching the video. Take a look! *grins* You can also visit their site too. Click here. [x] I think I’m ugly sometimes. --- Unpretty, right? [x] I am self-conscious about my appearance. --- coz I have low self-esteem. Haha! [ ] I have/I’ve had braces. [ ] I wear glasses/contacts. [ ] I’ve been told I’m attractive by a complete stranger. [ ] I’ve sworn at my parents. [x] I want to have kids someday. --- I mean, who doesn't? [ ] I’ve fallen asleep at work/school. [x] I’ve missed a week or more of school. --- For a trip to Hong Kong! [ ] I’ve stolen something from my job. [ ] I’ve been fired. [x] I’ve slipped out a “lol” in a spoken conversation. --- It's already a expression now! [ ] I’ve peed from laughing. [ ] I’ve snorted while laughing. [ ] I’ve glued my hand to something. [ ] I’ve had my pants rip in public. [ ] I’ve gotten stitches/staples. [ ] I’ve broken a bone. [ ] I’ve had my tonsils removed. [ ] I’ve had my wisdom teeth removed. [x] I’ve had chicken pox. [x] I’ve been on a plane. [ ] I’ve been to Canada. [ ] I’ve been to Mexico. [ ] I’ve been to Niagara Falls. [ ] I’ve been to Japan. [ ] I’ve celebrated Mardi Gras in New Orleans. [ ] I’ve been to Europe. [ ] I’ve been to Africa. [ ] I’ve gotten lost in my city. [x] I’ve seen a shooting star. [x] I’ve wished on a shooting star. [ ] I’ve seen a meteor shower. [ ] I’ve gone out in public in my pajamas. [ ] I’ve pushed all the buttons on an elevator. [ ] I’ve kicked a guy where it hurts. [ ] I’ve been to a casino. [ ] I’ve been skydiving. [x] I’ve played spin the bottle. [ ] I’ve drank a whole gallon of milk in one hour. [ ] I’ve crashed a car. [ ] I’ve been skiing. [x] I’ve been in a play. [ ] I’ve met someone in person from myspace. [ ] I’ve caught a snowflake on my tongue. [ ] I’ve seen the Northern lights. [x] I’ve sat on a roof top at night. [ ] I’ve played chicken. [ ] I’ve played a prank on someone. [ ] I’ve ridden in a taxi. [ ] I’ve seen the Rocky Horror Picture Show. [ ] I’ve eaten sushi. [ ] I’ve been snowboarding. [ ] I’ve been the dumped more than the dumper. [x] I miss someone right now. --- Not just one! [x] I have a fear of abandonment. --- I guess we all have! [ ] I’ve gotten divorced. [x] I’ve had feelings for someone who didn’t have them back. --- Not just one! [ ] I’ve kept something from a past relationship. [ ] I’ve hugged a stranger. [x] I’ve done something I promised someone else I wouldn’t. --- Out of vengeance? Haha! [x] I’ve done something I promised myself I wouldn’t. --- It's just too hard to resist. [ ] I’ve cheated while playing a game. [x] I’ve cheated on a test. --- Since I entered college! Haha! [ ] I’ve run a red light. [ ] I’ve witnessed a crime. [ ] I’ve been arrested. [ ] I’ve consumed alcohol. [x] I’ve passed out from drinking. --- Haha! [ ] I’ve taken painkillers when I didn’t need them. [ ] I’ve eaten shrooms. [ ] I’ve popped E.
[ ] I’ve inhaled Nitrous. [ ] I’ve done hard drugs. [ ] I have cough drops when I’m not sick. [ ] I shut others out when I’m depressed. [ ] I’m anorexic or bulimic. [ ] I’ve slept an entire day when I didn’t need it. [ ] I’ve hurt myself on purpose. [ ] I’ve woken up crying. [x] I’m afraid of dying. --- Kinda! [x] I hate funerals. --- I do! They make me cry. [ ] I’ve seen someone dying. [ ] I’ve planned my own suicide. [ ] I’ve attempted suicide. [ ] I’ve written a eulogy for myself. [x] I can sing well. [ ] I’ve stolen a tray from a fast food restaurant. [ ] I don’t kill bugs. [ ] I’m a snob about grammar. [x] I am a sports fanatic. [x] I love being neat. [ ] I’ve copied more than 30 CD’s in a day. [ ] I’ve worn pajamas to school. [ ] I’ve not turned anything in and still got an A in a certain class. [x] I can’t sleep if there is a spider in the room. [ ] I’m good at remembering names. [ ] I’m good at remembering dates. Common viruses, and even the viruses that cause mononucleosis (mono) and the flu, can cause a sore throat. Some viruses can also produce blisters in the mouth and throat ("aphthous stomatitis"). Sore throat appearing after treatment with antibiotics, chemotherapy, or other immune-compromising medications may be due to Candida, commonly known as "thrush." A humidifier may be helpful in relieving symptoms, especially in sore throats caused by mouth breathing and dry air. Acetaminophen or ibuprofen may help control the pain. For adults, if your nose is plugged, nasal sprays such as Afrin may be used for two to three days to prevent mouth breathing. It is NOT a good idea to use these products for more than a couple of days; you may become dependent on them. Other decongestant products, such as Sudafed, may be helpful. This morning, I heard a news from the radio saying that there's a virus detected on some pigs in our country. Oh my! Pigs? I love pork!!! Noooo! So I searched about the news and found this most accurate news online. This news is taken from The Earth Times. Manila - Philippine President Gloria Macapagal Arroyo Thursday ordered agriculture and health officials to closely monitor an outbreak of an Ebola virus strain in several pig farms in three northern provinces. Deputy presidential spokesman Anthony Golez said Arroyo wanted agriculture authorities to prevent the Ebola Reston virus from spreading to other pig farms in the country. Golez, a medical doctor, assured the public that the Ebola Reston virus found in the pigs was not harmful to humans. "From the epidemiological standpoint, humans have high tolerance for this virus," he said. "Just like any other food, we should make sure that the food we are preparing is cooked properly." Golez said the Ebola Reston virus dies at 70 degrees Celcius, which is below boiling point. Agriculture Secretary Arthur Yap said the government had temporarily suspended exports of all pork products from the Philippines until the virus has been eradicated. "Although the virus does not affect the health of humans, we decided to put on hold all exports," he said. "Let us eradicate first this virus." Yap said agriculture technicians confirmed that 28 pigs from four piggeries in the northern provinces of Bulacan, Pangasinan and Nueva Ecija had tested positive for the virus during a recent random check. He said the Bureau of Animal Industry set up pig checkpoints to prevent the transport of contaminated animals. A total of 42 people who had close contacts with the contaminated pigs had tested negative for the disease, Yap said. So it's not really that harmful, right? But still, we have to be careful on what we eat. Well I have noticed that most animals have diseases or virus. Maybe the safest way to avoid these is to change our lifestyle. Vegetables and fruits are more nutritious. Let us all be vegetarians! *laugh* Yeah right... I, myself, can't be a vegetarian. I mean, I don't think I'd be happy being a vegetarian. I'm an omnivore! *winks* But then seriously, friends, let's be careful alright? Just be careful. 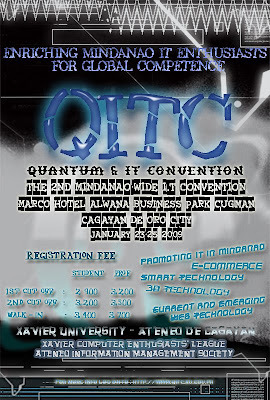 Come and join the 2nd Mindanao-wide Quantum and IT Convention!